Download Kimbho Swadeshi Chat App : So, now India's Top Yoga Guru "Baba Ramdev" ready to beat Instant messaging world with its own chat application named 'Kimbho Swadeshi Chat App'. Recently, Patanjali launched its own SIM Card partnered with Indian government telecom company BSNL. Yoga Guru, on Wednesday launched this chat application take on many other chat apps like WhatsApp. The New swadeshi chat app Kimbo launched under Ramdev's flagship company Patanjali. Baba Ramdev alos gives tagline to its messaging app " Ab Bharta Bolega". The main aim of this application is to give the tuff competition to World's No. one messaging application WhatsApp. Until, now, there is no official statement announced by Baba Ramdev, on Kimbo App. Kimbo is also available on Google Play store, From where, all Indians can download and install this application. Its not new in instant messaging application era, there are several Indian chat application available on the google play store,but as we know they aren't quite popular like whatsapp. To take a move in technology and Empower make in India Campaign, Ramdev takes a new step in the form of SIM & Application. As I told you, Patanjali, The Aayurveda brand, launched 4G SIM Card & now application to. Below we are sharing some basic features and functionality of this Application Kimbho. Kimbhi is real messaging application comes with several decent features like WhatsApp. 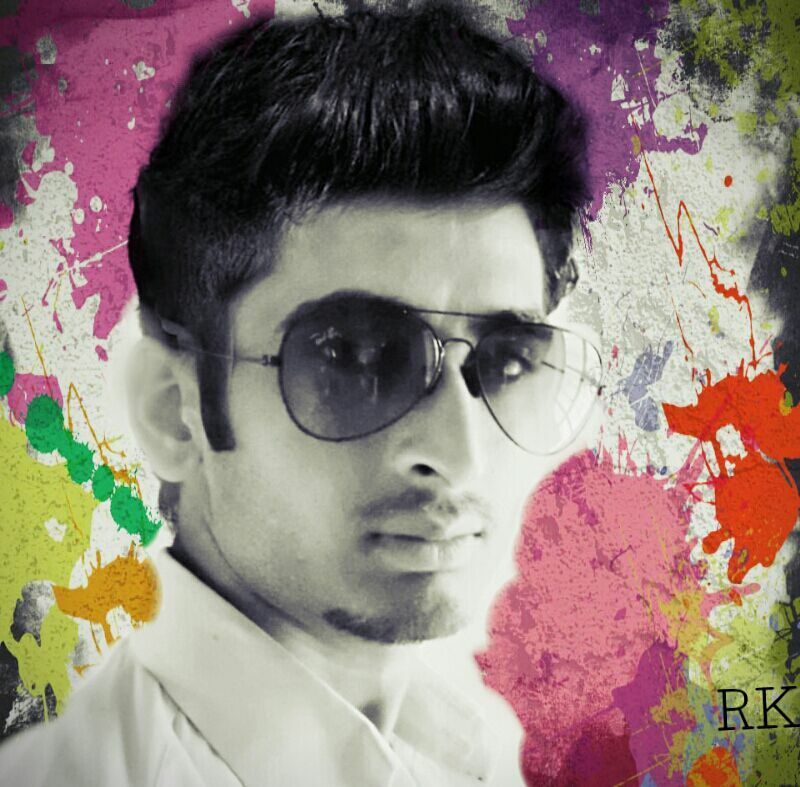 Users can personalised this app by creating themes along with feature like Wallpaper. Users can change Wallpaper any time whenever they want. This function already available on WhatsApp. The Kimbho App size is 22MB. "Kimbho is a real messaging app and empowered private and group chat with free phone and video calling. It has dozens of amazing features to share text, audio, photos, videos, stickers, quickies, location, GIF, doodle and more", it is the description of this application mentioned on google play store. Update: The Kimbho messaging app appears to have been taken down from the Google Play Store. 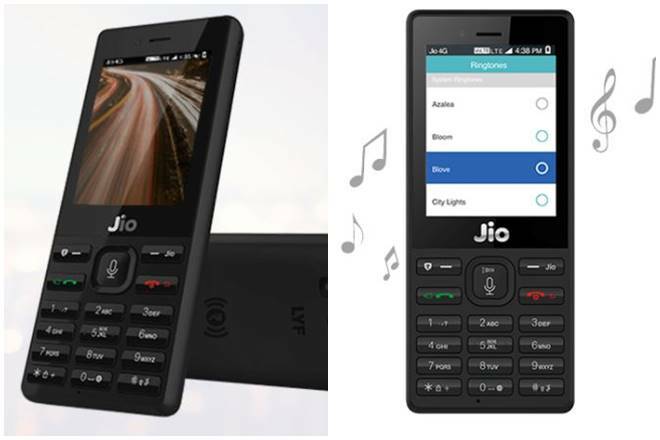 According to Patanjali Communication, It is claims that the app is fast and powered by advance socket technology which ensures instant, real-time messaging. Features like Encryption Also in built in the Application. WhatsApp also provide this feature to its users to avoid tracking and provide more privacy to its users. If you are using WhatsApp, you're getting encryption benefit. Also same technology used in the Kimbho Application to give more privacy to its users. In kimbho App, every message sent is encrypted by AES Technology. Its also supports function like ghost chatting, auto delete messages. Well, there will be a tuff competition between popularity of WhatsApp in India & new Swadeshi App Kimbho. 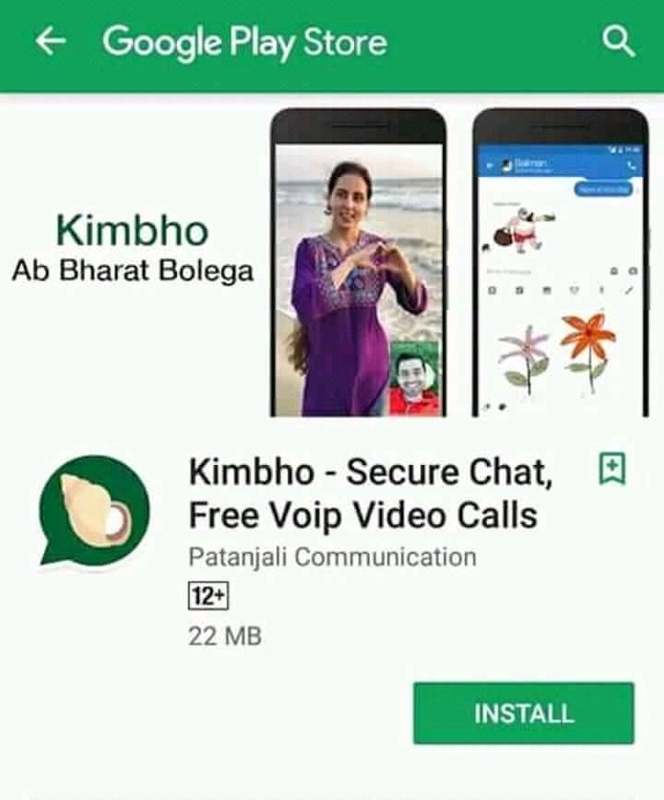 Kimbho also promoted under the Tagline 'Ab Bharat Bolega'. Update 2 : "Kimbho app is now ready with new and advanced features," said a tweet by Patanjali Ayurved Managing Director Acharya Balkrishna. According to Patanjali Communications, " Patanjali family is grateful to you for keeping faith in us. 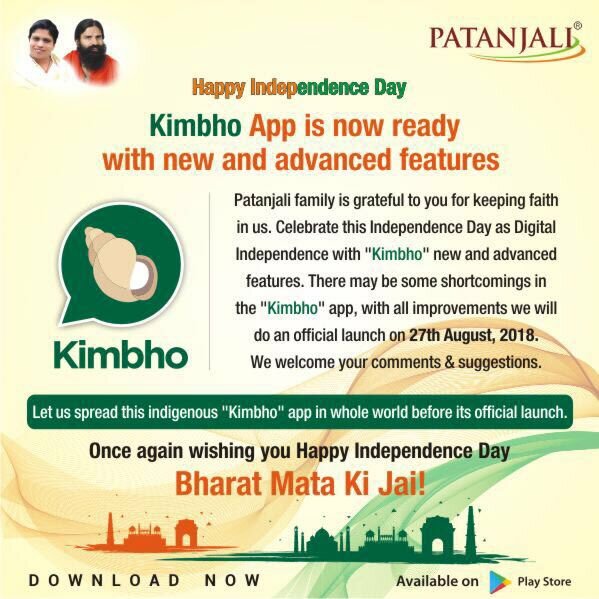 Celebrate this independence Day as Digital Independence with "Kimbho" new advanced features. We know that when Kimbho Application first launched in June found some security issues and several bugs as a result, App was shutting down by Google from its Play Store. Now again Patanjali communications ready to launch this application after fixing issues and bugs. On 27th August 2018, Patanjali will release its Kimbhi app again. 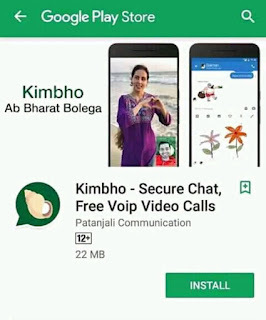 It is also claimed by Patanjali Communications that Kimbbho application no saves its users data to its servers and cloud.